Kokeshi dolls are wooden dolls made on the rokuro tool or lathe, and its origin traces back to the end of the Edo period. In many Tohoku hot spring resorts, they were considered souvenirs for customers who stayed there for toji or hot spring recuperation. Gunma prefecture is the largest kokeshi-doll producer in the country. Today, kokeshi dolls are used as gifts for celebrations such as weddings, birthdays and retirement. 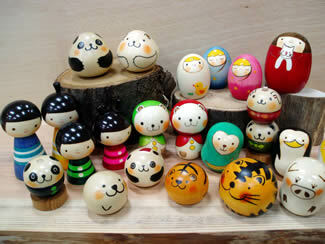 Also, kokeshi dolls can be great gifts to foreign countries as they are very unique Japanese dolls.